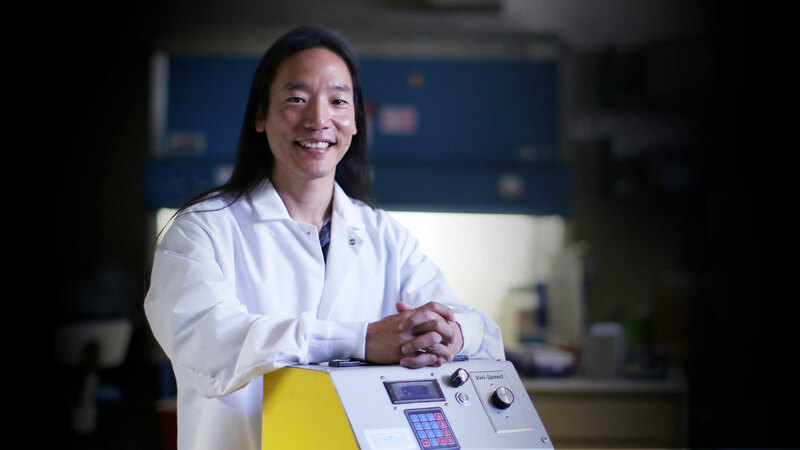 John Chi creates a device to harvest the body’s versatile master stem cells. Headlines have proclaimed the wonders of stem cells for decades. Scientists hypothesize they can provide the key to understanding or even curing dozens of conditions, bringing hope to people with everything from Alzheimer’s disease to diabetes to baldness. But the road that leads from hypothesis to research-supported treatment is long. Questions still surround stem cell therapy. The process will allow doctors to create treatments using a patient’s own stem cells, Chi says. Alumnus John Chi hopes to help answer some of those questions. Chi has created a device designed to safely harvest stem cells and allow them to be used in treatment and for research. “This is something that people have to have access to. So I started looking at ways to get the cells to people,” says Chi, who is founder and CEO of Synova Life Sciences. Chi’s device harvests stem cells from fat tissue for use in regenerative therapy for joints. The process will allow doctors to create treatments using a patient’s own stem cells, Chi says. He is seeking U.S. Food and Drug Administration clearance for the device. Synova’s executive team includes Dr. Mark Richman, an internal and emergency medicine physician, who serves as the chief clinical officer and works on the regulatory and clinical side of the business. Dr. Ray Raven, a board-certified orthopedic surgeon, is the chief medical officer. The stem cell field has come a long way since its controversial beginnings in the latter half of the 20th century. Stem cells were first discovered in human cord blood in 1978. And for a long time after, much of the research focused on embryonic stem cells, which can grow to become any of the body’s approximate 200 cell types. But creating cell lines for research and testing meant the destruction of human embryos. The ethical implications led to public outcry and a subsequent ban on federal funding for research on new human embryo stem cell lines. The funding limitations stalled, but didn’t stop, scientific progress in the field. In time, researchers would discover that deposits of adult stem cells—mature cells that can regenerate and repair tissue—existed in many areas throughout the human body, including in bone marrow and fat. In 2007 a breakthrough occurred. Japanese scientist Shinya Yamanaka and his research team demonstrated that adult cells could be converted back into stem cells. The ability to reverse the cell development process revealed an alternative free from the ethics controversy. The discovery won Yamanaka a shared Nobel Prize for Physiology or Medicine in 2012 and re-energized the field of study. Around the same time, Chi was pursuing a Master of Biotechnology at Cal State LA. While in the program he became captivated by stem cells. The potential excited Chi, who has family and friends who could be helped: his father with an arthritic hip; his friends with various sports injuries. Chi thought first about opening up a stem cell treatment clinic. But the science had not advanced enough for such a venture. More studies and evidence were needed before scientists could develop additional approved treatments—despite the miracle claims of some clinics. Only treatments for blood-forming stem cells derived from bone marrow, peripheral blood or umbilical cord blood have proved effective enough to receive clearance by the U.S. Food and Drug Administration. A debate hinges on whether stem cell treatments should be treated like tissue transplants, which don’t require FDA clearance, or manufactured drugs, which do. Chi shelved his idea to start a clinic, and instead sought to explore ways to safely harvest and use stem cells with minimal handling or alteration. 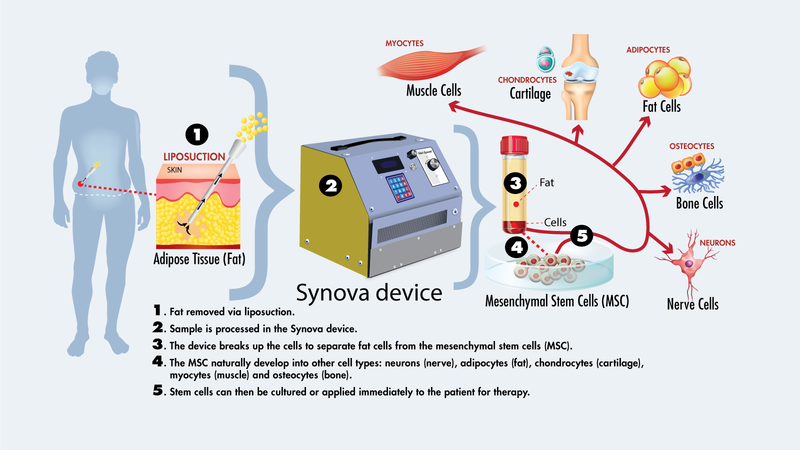 According to the FDA, in order to meet regulatory standards, stem cell treatments must generally meet several major requirements: the function of the cells in the recipient’s body must be the same as in the donor cells or tissue; the treatment cells must not affect the recipient’s whole body; and the cells must be only “minimally” manipulated. In November, the FDA announced plans to crack down on private clinics performing risky experimental stem cell procedures. The agency also released new guidance to help manufacturers and clinicians navigate the regulations in place. Currently, practitioners use many different operating protocols for extracting stem cells from within fat tissue. One prominent method deploys enzymes to dissolve the fat around the stem cells—a process that is slow, destructive and not approved by the FDA. Other methods pose contamination risks, require costly equipment, are difficult to use or simply don’t yield enough viable stem cells to make it worth the process, Chi says. Once the tissue enters the device, nothing else touches it until it emerges with the fat removed and the regenerative cells in a readily usable form inside of a syringe. The mature stem cells derived from fat tissue are naturally capable of developing into bone, fat, muscle and cartilage without additional manipulation, Chi says, and can be developed into therapies. The entire process takes under an hour, which means doctors can surgically remove fat from a patient, process the tissue and apply the extracted stem cells into the same patient all in the same procedure, Chi says. Using a patient’s own cells eliminates the risk of disease transmission or cell rejection, and the closed system process reduces exposure to environmental contamination. Chi is seeking FDA clearance for the Synova machine, which could be used in clinics, he says. Because it produces a high yield of quality stem cells, it will help support research as well, Chi says. Chi completed his master’s degree in 2015. He continued to make breakthroughs in the development of his prototype and business. He’s presented—and won—several business pitch competitions, including the Cox Business Get Started Orange County contest in 2017. The prize money will help Synova refine the device’s design as the company enters the manufacturing phase of the project. Chi holds two provisional patents and Synova has submitted applications for non-provisional and international patents. For now Chi is focused on submitting his device for FDA clearance. Working from a lab at Huntington Medical Research Institutes in Pasadena, he collects tissue samples from local plastic surgery centers to test and refine his machine. Cal State LA microbiology professor Howard Xu, who taught laboratory courses that sparked Chi’s interest during his graduate studies, looks for ways to support his former student’s efforts. Xu checks in with Chi often, offering advice and steering him toward events and meetings that help him grow his business. Xu encouraged Chi to apply to the LA BioStart Bioscience Entrepreneurs Boot Camp last summer. Chi was a part of the first cohort to participate in the five-week program funded by the U.S. Economic Development Administration. The intensive training provides startup companies with skills, mentoring and business knowledge essential to starting and sustaining bioscience ventures. 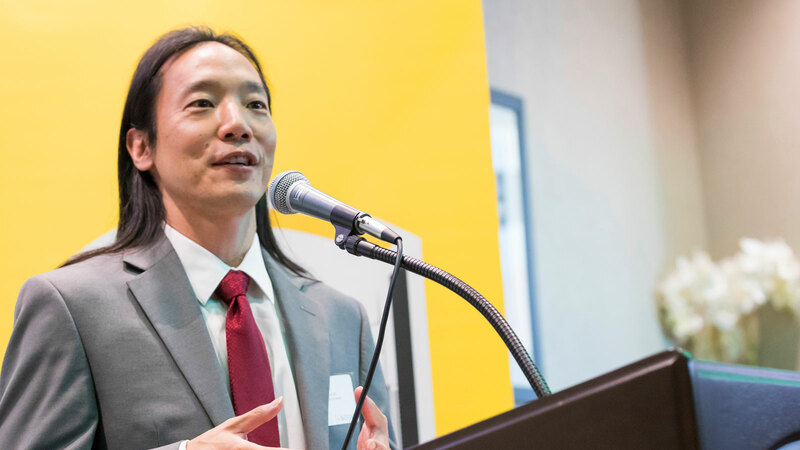 Xu is the director of the initiative, which is a collaboration between Cal State LA, the Biocom Institute and the Los Angeles Cleantech Incubator. The sessions were led by top industry experts on business fundamentals, financing models, industrial research and development, regulatory affairs, quality systems, clinical trials, leadership skills and communication strategies. Chi is also looking forward to reserving workspace at the LA BioSpace incubator at Cal State LA after construction is completed on the Rongxiang Xu Bioscience Innovation Center. Scheduled to open in 2018, the facility will equip entrepreneurs with the skills they need to turn scientific advances into job-creating businesses. Chi is excited about the possibilities in the field. The time is ripe for great strides in stem cell research, he says. Kate Kealey is a Los Angeles-based writer. 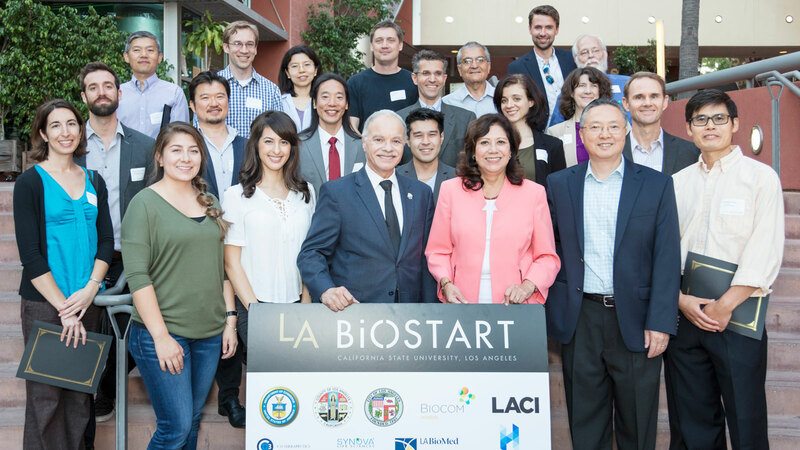 Group photo: John Chi and the first Cal State LA Biostart Bootcamp team with Los Angeles County Supervisor Hilda L. Solis (in Pink), Cal State LA President William Covino (to her left) and LA BioSpace Director, Howard Xu (to her right).